If you liked Vegan with a Vengeance by the Post Punk Kitchen’s Isa Chandra Moskowitz…you must check out her newest collaboration, Veganomicon. I checked it out from the library this week and have been really excited to try a few recipes. 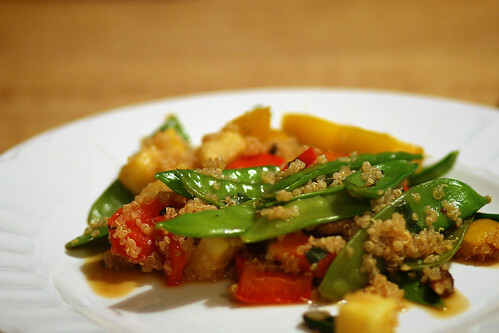 I chose the Pineapple Cashew Quinoa Stir-Fry….and OH MY WORD. I could not be happier. It was so delicious…I was in foody heaven. The flavors just popped. Plus, I LOVED the quinoa (pronouned “keen-wah”) with this instead of rice. The quinoa seed is high in protein, calcium, iron, lysine, vitamin E and B vitamins. It contains almost a perfect balance of all eight essential amino acids needed for tissue development in humans. This makes the protein in quinoa a “complete protein”. If you’re not currently eating quinoa…you should start. It’s so versatile…we just ate it for breakfast the other day! I did modify a few things here and there…but that’s the great thing about stir-fry. You can use whatever you have on hand. We didn’t have the cashews, the hot pepper, or the mirin…it would be even better with them! I hope you enjoy this as much as we did. Quinoa, the high-protein South American grain, is delicately flavored by being cooked in a little pineapple juice, then it’s the base for this colorful and speedy stir-fry featuring crisp veggies, fresh ginger, and crunchy cashews. Make the quinoa a day or two in advance and store it in the fridge and you’ll be able to put this stir-fry together in a snap for an easy weeknight dinner. It’s a meal in itself, or serve alongside any marinated and grilled tempeh. Prepare the quinoa first: Combine the quinoa, juice, water, and soy sauce in a medium size pot. Cover and place on high heat and bring to a boil. Stir a few times, then lower the heat to medium low, cover and cook for 12-14 minutes until all the liquid has been absorbed and the quinoa appears “plumped” and slightly translucent. Uncover, fluff and set aside. Prepare the stir-fry: Use the largest skillet you have (or a wok). Have all your ingredients chopped and easily within reach. Place the cashews in the dry pan and heat over low heat, stirring them until lightly toasted, 4-5 minutes. Remove the cashews from the pan, raise the heat to medium, and add the oil, scallions, and garlic. When the garlic starts to sizzle, add the sliced chili pepper and ginger. Stir-fry for about 2 minutes, then add the bell pepper and peas. Stir-fry for another 3-4 minutes, until the bell pepper is softened and the peas are bright green. Add the basil and mint and stir for another minute before adding the pineapple and quinoa. In a measuring cup, combine the soy sauce, veggie stock, and mirin. Pour over the quinoa/veggie mixture. Stir to incorporate completely and coat it. Continue to stir-fry for 10-14 minutes, until the quinoa is very hot. Serve with lime wedges and additional soy sauce to season individual servings to taste. It’s critical that you use all fresh ingredients (herbs, ginger, veggies) in this. That is where the flavor comes from! Pay close attention to the timing…so that you don’t end up with stir-fry mush. The CRISPNESS of the veggies is what makes it great. I always try to make twice as much quinoa so I can save the other half for another meal…it makes it so much easier! If you’re not a vegetarian, this is a great dish to add chicken or shrimp to. If you’re in a hurry, hit a deli or grocery store’s salad bar (or produce section) for pre-cut pineapple chunks. For a truly gorgeous dish, use a blend of the white quinoa and the red inca variety with cooks up to a deep russet color. Entry filed under: Entree, Ethnic Foods. I made this dish last week, and we really loved it! We used all red quinoa, and it was really great.